Drs. 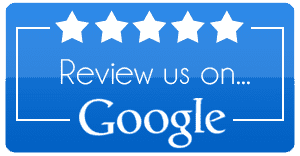 Chris and Kristie Vinson are pleased to provide patients with dental implants. Dental implants are a practical approach to smile restoration that replaces excessively damaged or missing teeth with an artificial tooth root and dental prosthesis. The artificial tooth root is composed of a titanium screw that fastens into the jawbone and fuses with the surrounding bone to act as an anchor for the dental prosthesis. This dental prosthesis can be a crown, bridge, or even dentures. 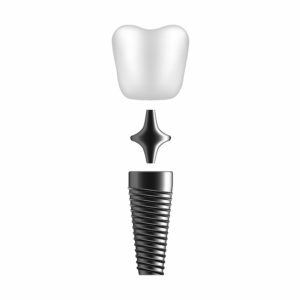 There are two types of dental implants: subperiosteal and endosteal. Subperiosteal implants are not commonly used because they sit on top of the jaw bone just under the gum line instead of sitting within the jawbone. Endosteal implants are far more common and are usually the recommended choice. Endosteal dental implants are made up of three individual components: the implant, abutment, and dental prosthesis. Dental implants may be right for you if you are missing a tooth or teeth and are looking to restore the function and appearance of your smile. Dental implants may also be a good choice for you if you have conventional dentures that are uncomfortable or if you wish to avoid wearing conventional dentures altogether. To find out for sure if dental implants are right for you, schedule a consultation with Drs. Chris and Kristie Vinson today! In some cases, bone grafts may be necessary to ensure a successful treatment outcome. When teeth have been missing from the mouth for long periods of time, the jawbones can deteriorate, causing the bone mass to decrease. If there is not enough bone for the implants to attach themselves to, them they will most likely fail. To avoid this complication, bone grafts are used to replenish bone mass prior to dental implant placement. During your implant consultation, Drs. Chris and Kristie Vinson will discuss whether or not you need a bone graft. If you need a bone graft, it is a relatively easy procedure. During a bone graft bone tissue will be taken from somewhere in your body or a synthetic material will be applied to the area lacking in bone mass. This tissue or synthetic material will gradually produce new bone growth and increase the bone mass, allowing for the placement of dental implants. 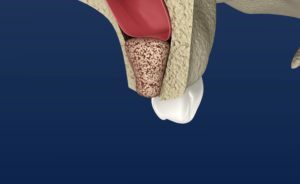 One common type of bone graft you may need is called a sinus lift. Sinus lifts are performed when implants need to be placed in your maxilla, or upper jaw. They are special bone grafts that thicken the maxilla bone that lies just below your maxillary sinus. Not only do they ensure your dental implants will have enough bone to fuse to, but they protect your sinus cavity. During the procedure, you will be offered moderate sedation using local anesthesia or deep sedation using IV sedation. The length of your procedure will depend upon how many implants are being placed and on your specific treatment needs. Dental implants are placed by making a small incision in the gum line to access the jawbone. Once the jawbone is exposed, our dentists will use a series of gradually increasing drill bits to gently drill out the chamber to make room for the implant. The final drill bit will carve out teeth in the bone for the implant to screw into. The implant will then be placed and fastened into this chamber. At this point, the abutment may or may not be attached before suturing the gums. Once the implant has been placed, it will undergo a 3-6 month period of osseointegration, in which the bone will fuse around the implant and secure it in place. After the implant is properly fused to the bone, then the dental prosthesis will be attached, completing the procedure. After your dental implant procedure, you will be able to return home the same day. In the days following your procedure, you may experience mild swelling and discomfort. Depending on your treatment plan, our office may prescribe pain medication or advise you to take over the counter pain medications to help with this. While your implants heal, you will also need to be on a temporary soft foods diet. Foods such as yogurt, applesauce, eggs, steamed veggies, pasta, fish, and other soft foods that require minimal to no chewing are required. As your implants heal, you can gradually start working up to tougher foods. You will also need to keep your mouth clean during the healing process. Depending on your treatment plan, our office may supply you with a medicated rinse to use or provide you with specialized hygiene instructions. It is important to follow these instructions to optimize healing and reduce the risk of infection. Dental implants are the longest-lasting restoration method available, however their lifespan can vary. If properly maintained, dental implants generally last approximately 10 years. However, they have the potential to last longer and some have even been reported to have lasted up to 40 years! To make your dental implants last longer, you will want to practice good oral habits such as brushing twice a day, flossing once a day, and visiting Tulsa Precision Dental twice a year for your dental checkup and teeth cleaning. You will also need to avoid grinding or clenching your teeth, and will want to avoid foods that can damage your teeth, such as hard candies. Implants may restore your teeth to their natural strength, but keep in mind that natural teeth can become broken. Interested in dental implants? Schedule a consultation with Tulsa, OK dentists Drs. Chris and Kristie Vinson today! Do your dentures slip frequently or are they uncomfortable? While conventional dentures restore the appearance of your teeth, they cannot offer the same level of function that dental implants can. Fixed implant dentures utilize dental implant technology to secure your dentures in a way that restores both the appearance and function of your teeth. Drs. Chris and Kristie Vinson offer TeethXpress fixed implant dentures that mount your denture to surgically placed dental implants, effectively securing the denture and allowing you to eat, speak, and live confidently. Dental implants are artificial tooth roots made of titanium screws that are fastened into the jawbone and will fuse with the surrounding bone to create an anchor to support your dentures. TeethXpress uses dental implants manufactured by BioHorizons. These dental implants have a 99.2% success rate in dental implant procedures. What is the difference between conventional dentures and fixed implant dentures? Conventional dentures replace missing teeth and partially restore chewing and speaking function. However, they are primarily designed to restore your appearance and are structurally unable to restore your teeth’s function. This is due to the fact that your jaw undergoes bone reabsorption once your teeth are lost. Without proper stimulation from tooth roots, your jawbone will continue to deteriorate, causing your jaws to change shape, and eventually lead to your denture no longer fitting. Fixed implant dentures, on the other hand, replace your missing teeth while also restoring their function. By placing dental implants into the jawbone, the bone receives the necessary stimulation to prevent bone reabsorption. Furthermore, the implants fuse to the bone and provide similar strength and function as that of your natural teeth. Also, because your jaw won’t change shape as a result of bone reabsorption, your dentures will continue to fit and you will not need to constantly adjust them. 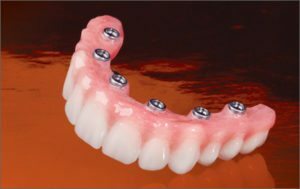 Are fixed implant dentures the right choice for me? Fixed implant dentures are ideal for individuals who have missing teeth and seeking a long-lasting restoration solution. Furthermore, they are also recommended for those who have dentures that are uncomfortable or that slip frequently. To find out what fixed implant dentures can offer you, schedule a consultation with Drs. Chris and Kristine Vinson today! 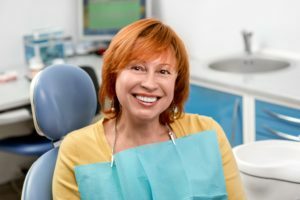 What can I expect during the fixed implant denture procedure? During the procedure, you will be offered moderate sedation using local anesthesia or deep sedation using IV sedation. Most procedures last for approximately 3-4 hours, however this can vary depending on your specific treatment needs. For fixed implant dentures, approximately four dental implants will be placed in the upper and/or lower jaw bone. These implants are placed by making a small incision in the gum line to access the jawbone. Once the jawbone is exposed, our dentists will use a series of gradually increasing drill bits to gently drill out the chamber to make room for the implant. Then, the implant will be inserted into the chamber with the abutment attached. Our dentists will then work on properly modifying the denture to work with the dental implants. 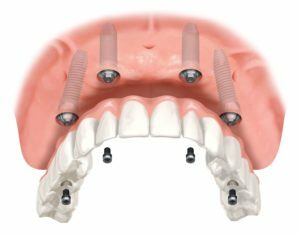 Once the denture has been altered, it will be fastened to the dental implants via the abutment. With TeethXpress fixed implant dentures, you will leave our office the same day with your new teeth. How long is the recovery period for fixed implant dentures? After your procedure, you should be able to return to work within 1-2 days. In the first few days following surgery, you may experience some minor discomfort and may have pain medication prescribed to help alleviate this. While you are recovering, you will need to adhere to a soft food diet and use a medicated mouthwash for the first two weeks following your procedure. How long will fixed implant dentures last? Since fixed implant dentures utilize dental implant technology, they last much longer than conventional dentures and other restoration methods. Their specific lifespan will depend on a number of factors, and varies patient to patient. However, most dental implants last for approximately 10 years, and some have even been known to last for more than 40 years. To extend the lifespan of your fixed implant dentures, you will want to carefully maintain them and keep them properly cleaned. Brushing your dentures twice daily and flossing between your teeth and along the abutments will help to maximize your oral health and keep your implants lasting longer. It is also important to visit Tulsa Precision Dental twice a year for a dental checkup and teeth cleaning. How much do fixed implant dentures cost? The cost of fixed implant dentures is determined by the cost of dental implant treatment. An average cost can range from $1,500-$6,000, however your specific cost will depend on a number of factors. Keep in mind that fixed implant dentures with TeethXpress are less expensive than other restoration methods, such as traditional crowns and bridges. If you have dental insurance, you may be able to obtain partial coverage for fixed implant dentures. However, the total amount of coverage will depend upon your individual insurance company. Our office can help you maximize your dental insurance benefits. 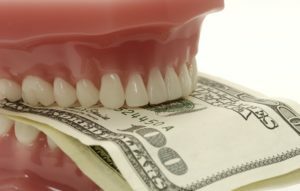 Although fixed implant dentures can seem expensive, you will also want to consider the cost of opting not to get them. With conventional dentures, your teeth will never regain their full function and your jawbone will continue to slowly deteriorate without proper stimulation of the tooth roots. This bone deterioration will eventually change the shape of your face and cause your conventional dentures not to fit. Because of this, it is recommended that your dentures get replaced every five years. Fixed implant dentures, however, will continue to last you many years and will not need to replaced every five years.